Fans of authentic Italian cuisine are invited to sample the delights of our contemporary restaurant. 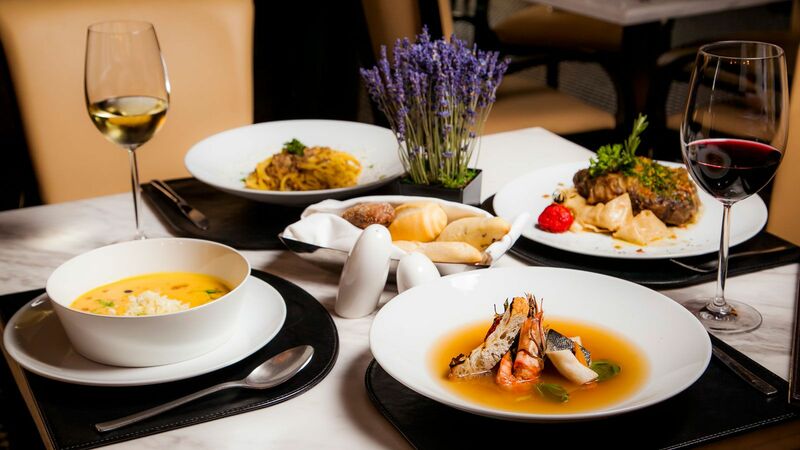 Each season, the A Tavola transports guests to one of Italy’s regions of exemplary cuisine: Piedmont, Lombardy, Liguria is reflected in original piazza tables, which create the casual and lively atmosphere of a genuine osteria. But no matter which region is chosen, a seasonally flavored menu will catch the guests’ eye. Cold and warm antipasti, salads, homemade pasta, panini and focaccia will catch diners’ eyes on a compact menu that changes with the seasons. Waiters offer traditional and new Italian wines by the glass, as well as slices of Parma ham, salami and mortadella. A Tavola is ideal for informal meetings as well as business lunches. *Discount is not applicable for special offers, breakfasts, lunches and all kinds of drinks. Our highlight for members of Starwood Preferred Guests only: now you save 15% on all delicacies at the Italian Osteria A Tavola*. *Discount is not applicable for special offers, breakfasts and lunches. Opening hours 12:00 p.m. - 12:00 a.m.
Breakfast weekdays hours 6:30 a.m. - 10:30 a.m.
Breakfast weekend hours 6:30 a.m. - 11:00 p.m.
Art lunch weekdays hours 12:00 p.m. - 3:00 p.m.